The main exhibition and concert hall in Belfast for a long time has been The King's Hall. 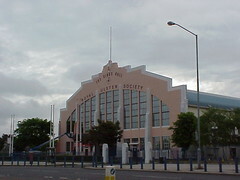 It was built in the early 1930s for the Royal Ulster Agricultural Society and hosts the annual agricultural show. 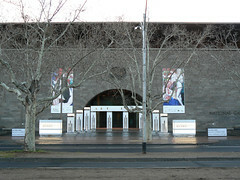 The stepped facade with a series of deco fins hides the semi-circular auditorium. 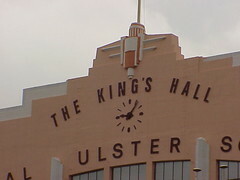 A simple clock at the centre of the facade sits below lettering spelling out "The King's Hall". 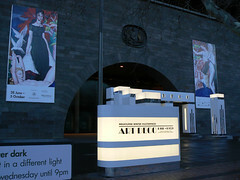 And just above that a is a beautiful art deco arrangement acting as a support for the flagpole. 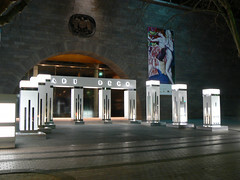 The area is surrounded by a blue railing fence supported by white deco pillars. 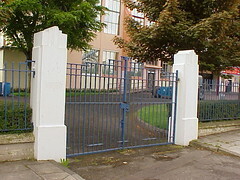 Even the gates themselves have a great deco style to them. This landmark parking garage in downtown Tulsa is a streamline beauty. 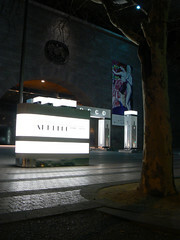 I love the sign which although it is large does not overpower the building. 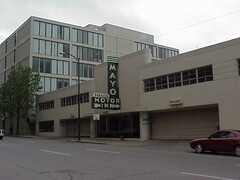 I think this is because the vertical sign is used to balance the horizontal bulk of the rest of the building. It is almost worth taking the car just to park here. Believe it or not, there are aspects of my lie that are not related to Art Deco. 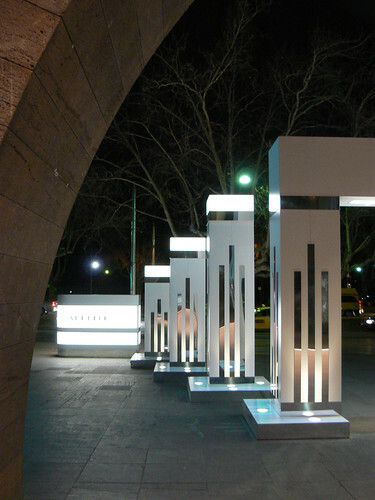 For one, I am a foundation member of the Port Melbourne Historical and Preservation Society (PMHPS) which naturally covers the whole area from before the first settlers in the area in 1839 through to the present day. 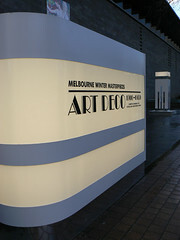 The 29th March 2008, marks the 100th anniversary of the visit of America's Great White Fleet to Melbourne, and therefore Port Melbourne, as part of their world tour. The US Navy frigate, John S McCain berthed at Station Pier today to commemorate that event. 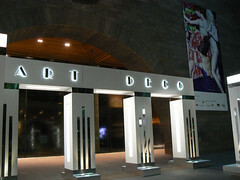 None of this is deco but I wanted to stay within Port so I came up with the Leading Lights. They date from the mid 1920s and consist of two beacons, one on land and one in the sea. When the lights from these beacons are aligned, they guide vessels to the piers at Port Melbourne. 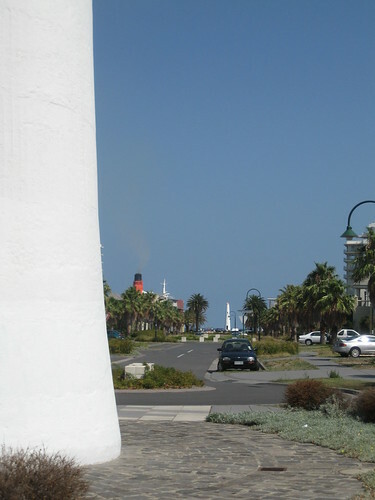 The photo above shows the sea beacon while the photo at right shows the inland beacon. The sea beacon can just be made out in the distance. 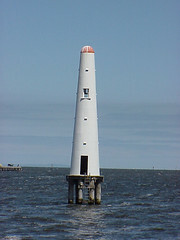 The Leading Lights have been superceded by more modern navigation aids and the inland beacon now houses a tri-part light which appears white when the ship is on-course without the need to be aligned with the other beacon. 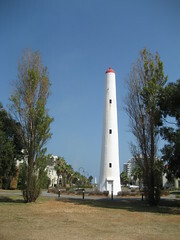 Still, they are a landmark of Port Melbourne and it is kinda fun to have a lighthouse on the edge of a city park. The housing development which has been built at its feet is called Beacon Cove and the street designed to maintain and celebrate the line of sight between the two beacons is called Beacon Vista. That is Beacon Vista below with the base of the inland beacon in the foreground and the sea beacon in the background. For the ship buffs, that red funnel over the palm trees is the QEII berthed at Station Pier on one of her last visits to Melbourne. 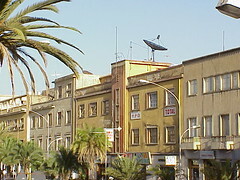 This is an interesting building in Harnet Avenue, Asmara. 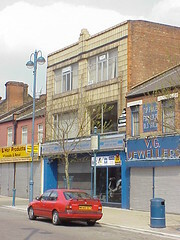 A row of shops occupy the ground floor while the upper floors contain apartments accessed from stairs in the central tower. The Total signage on the front of the building indicates a garage or service station but there is no evidence of petrol pumps on the street and the central doorway doesn't look wide enough to fit a car. My favourite detail is the support for the thin flagpole on the central column. Usually these decorative elements follow the rule of three but here we see the rule of four. Four metal bands supporting the flagpole tapering towards the base. 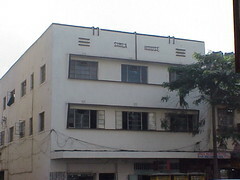 Simla House is a very sinple square building in Nairobi, Kenya. 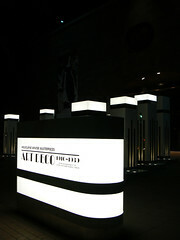 Even so it bears simple, elegant decoration. 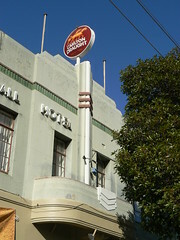 The name Simla House sits proudly in stylised letters, centred just below the roofline. 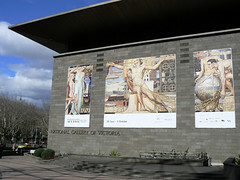 Either side of the name there are three short horizontal bands and then on the roofline itself four short vertical stripes, two each side of a longer stripe reaching down to the concrete shade over the upper storey of windows. Perhaps the best part of this apartment building in Durban is the hyphen but that is a bit flippant. Why Vel-Vet rather than plain Velvet. It probably doesn't matter. 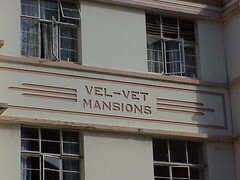 Vel-Vet Mansions is one of a series of buildings in Carlisle Street in the Indian section of Durban built in the early 1940s. 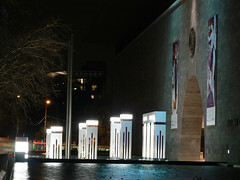 Vel-Vet is decorated with lines, squares, diamonds and triangles with the name on the front of the building between the second and third floors. 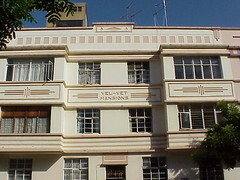 Other aprtment blocks in Carlisle Street have similar decoration and also bear their names on their facades but Vel-Vet is the only one with a hyphen. 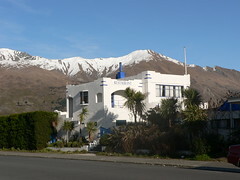 The White House restaurant is a wonderful art deco building in Wanaka on the scenic South Island of New Zealand. 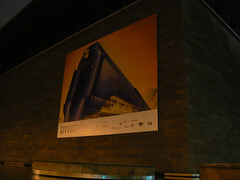 The building is a series of rectangular blocks with stepped rooflines, interestingly higher at the corners, stepping down to the centre. There are also several curved sections at the back. Decoration minimal consisting just of a couple of short horizontal lines wrapping around the corners, an arrangement of three vertical bars on the centre of the curved sections and a flagpole at the highest point on the building. The all is heavily stepped probably echoing stairs leading to the upper level. 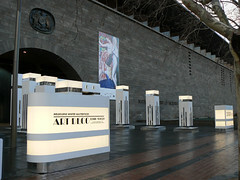 The double gate mirrors the roofline stepping down from the edges while square peepholes complete the design. I like the White House restaurant a lot ... no idea what the food is like. 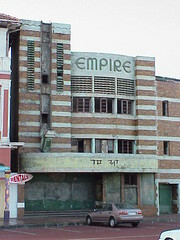 In 2003 when I visited the former Empire Cinema in Muizenberg, near Cape Town, it had been derelict for some time and was in a very bad state. Still there was still enough to see that it had once been a very handsome building. The horizontal nature of the building is highlighted with the alternating bands of brick and cream render. 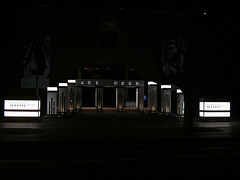 A large vertical sign at one end of the building had been removed but you could imagine it lit up beckoning people to the main entrance below the curving canopy presumably announcing that week's comming attraction. High on the facade there are a series of horizontal decorations embellished with short vertical bars and central stepped arrangement brought together to create an additional art deco feel. 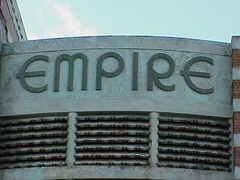 Then we come to the stylized lettering spelling out the name Empire. What a beauty. A bit of reseach on the web reveals that the Empire story appears to have a happy ending. The Empire and it's neighbour, Greens, have been refurbished and converted into residential flats as part of a redeveloped Muizenberg beach front. I found this modest deco shop in Woolwich, south-east London. At street level, the building has been modernised and could be any London shop but the upper floors boast a wonderful covering of cream tiles with a band of dark tiles above the windows. Above the band, in the close up below, you can see that the tiles are scalloped to provide another level of decoration. The column between the windows continues through to a great stepped ornament at the roofline. I'm not sure how old this piece of garden art is or whether it could be described as deco but there is something about it that I like a lot. 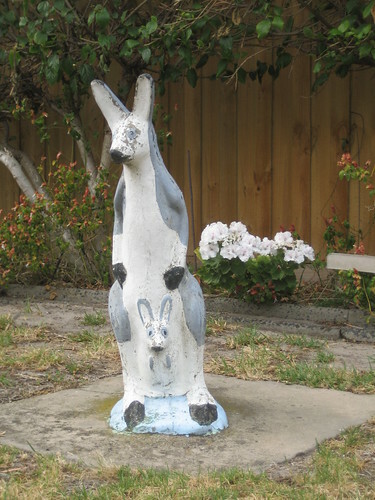 For a start it is in the garden of a 30s house and it does depict some local fauna. It looks like it is made of concrete and what a fabulous paint-job. It looks like the roo is wearing black boxing gloves. And the eyes are rendered in a classic caught in the headlights style. Even the joey seems mesmerized. Agatha Christie stayed here and set two of her books here. Naturally, Poriot visits during the British TV series of the same name and even an episode of the wide boy antique dealer Lovejoy was set here. I seem to remember Tinker disappearing and Lovejoy finding him on Burgh Island. 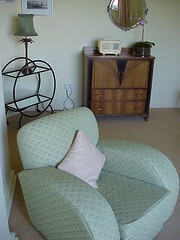 The Burgh Island Hotel offers a retreat from the modern world back to the glamour of the 1930s. 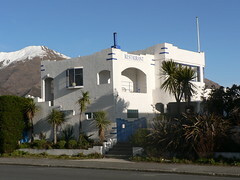 The hotel was built in 1929, from designs by Matthew Dawson, on a small island off the coast of Devon near Bigbury-on-Sea. It is accessible via a sand causeway at low tide and via an amazing contraption called a sea-tractor, at high tide. 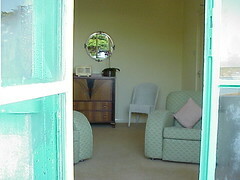 The rooms are named after some of the famous former guests. They are beautifully set up with period furniture and open balconies provide stunning views over the island and refreshing sea breezes. Burgh Island is a magical place and in this idyllic spot you really can step back it time and become anyone you wish. 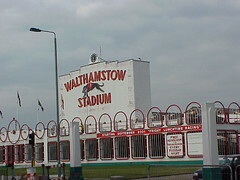 Walthamstow Greyhound Stadium will host its last night of racing tomorrow, Saturday 16th August 2008. 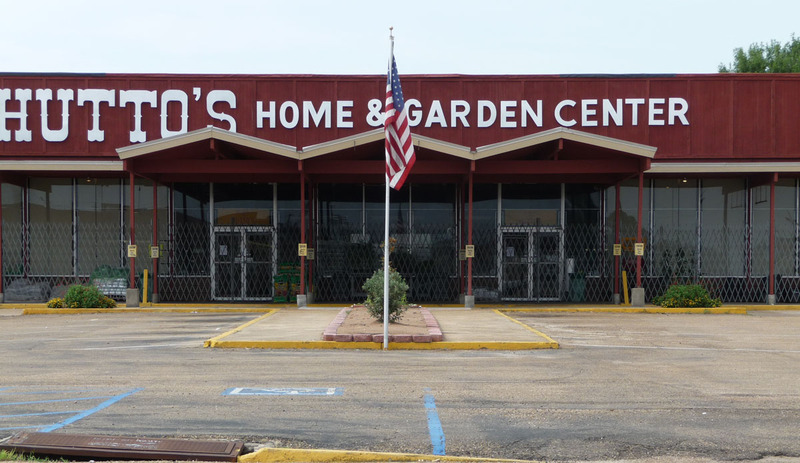 The stadium has been sold to a developer for housing spelling the end for this East End institution. Seventy-five years old this year The Stow provided a fantastic evening's entertainment watching the dishlickers do their stuff. 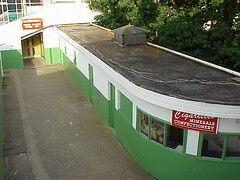 For me the bonus was the the 1930s deco styling as can be seen in the photo of the results board (above) and the concession stand on the popular side of the track (below). Naturally any one who has been to a greyhound meeting at Walthamstow will remember the neon on the results board after the sun went down. Pink, green and red spelling out the name of the stadium and outlining the speeding greyhound. 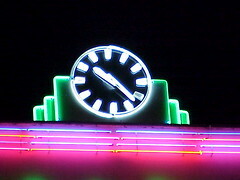 The stepped top of the board supporting a neon clock. 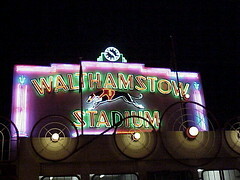 I've had a couple of great nights at the dogs in Walthamstow and it is sad to see it go. Anyone heading that way on Saturday, have a punt for me ... No. 1 in the first, it's bound to do well. 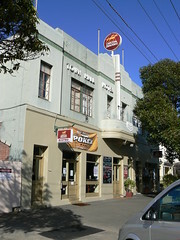 The Town Hall Hotel in Bank St, South Melbourne is another Melbourne pub that received a deco make-over in the 1930s. According to Pots, Punks & Punters, the St Kilda Historical Society's excellent history of St Kilda and South Melbourne pubs by Becky Aizen, the Cosmopolitan Hotel was in operation here in 1868. It was renamed the Town Hall Hotel in 1881, probably as a result of the construction of the magnificent South Melbourne Town Hall a year or so earlier. The town hall is also located in Bank Street but it is almost two blocks from the hotel so to me it is not an obvious name to choose. 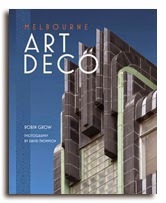 The art deco re-modelling was undertaken by architect, F Morsby in 1936. 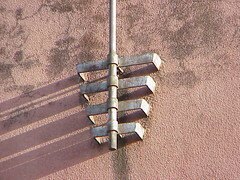 The central section is topped by two flagpoles and features a fin with three chrevrons just above a recessed band decorated with vertical ridges. A small curved balcony is also decorated with a variation on the chrevron theme in the form of a shield. There are no art deco details inside the Town Hall Hotel but it may be worth a visit on a Tuesday evening to sample their $12 chicken parma. Miami South Beach is famous for the deco hotels along Ocean Drive but there are lots of other deco buildings it seems there is almost one on every corner. 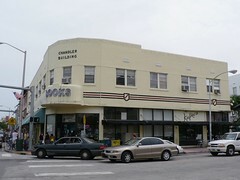 The Chandler Building is a large commercial building which curves around its prominent corner location. The parapet is slightly taller on the corner section then takes a single step down along the side. 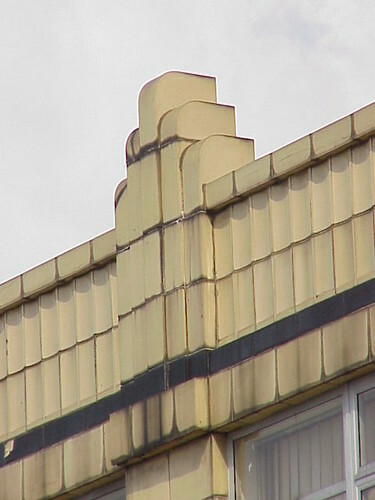 A band of stylised deco motifs sits just below the roofline but the most interesting feature to me is the red and black bands of tiles interspersed with naive shields. 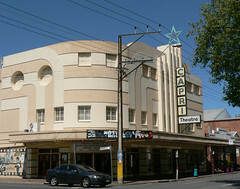 The Capri Theatre in Adelaide was opened in 1941 as the New Goodwood Star Theatre. 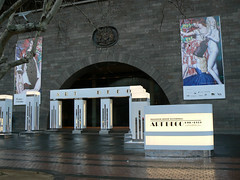 It was designed by architect Chris Smith and note there is still a star above the Capri name. I especially like the wide curving white bands on the facade and porthole windows along the side. 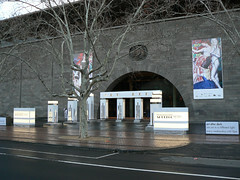 In recent years it has served as the headquarters for the Theatre Organ Society of Australia who have installed an incredible pipe organ with rises through the stage when it is being played. TOSA present a series of concerts as well as organ recitals for functions and events at the theatre. I was lucky enough to visit the theatre towards the end of a children's birthday party and the TOSA people let me sneak in to the back of the stalls to listen to (and look at) the organ and then give me a quick behind the scenes tour. The Capri is a great Art Deco cinema and a fantastic home for TOSA. 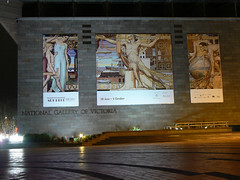 A selection of pictures showing how the National Gallery of Victoria has been promoting the Melbourne Winter Masterpieces exhibition, Art Deco 1910-1939 including a large poster of the Spirit of Progress locomotive, a reproduction of Napier Waller's I’ll put a girdle round about the earth (1933) and the temporary entrance on the forecourt on St Kilda Road. 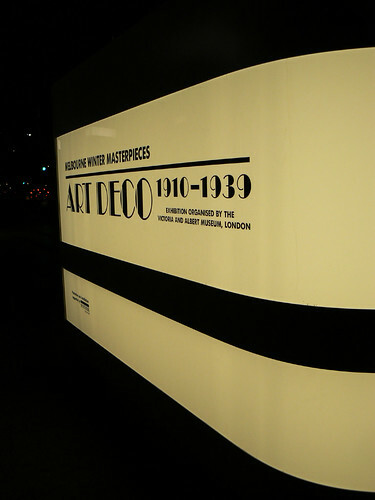 Organised by the V & A Museum in London, the Art Deco 1910-1939 runs until October 5, 2008.